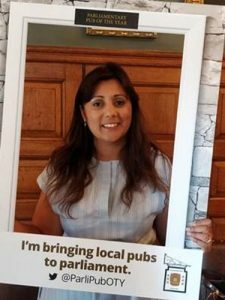 Wealden MP Nus Ghani is inviting her constituents to nominate their favourite local pub, to be entered into the Parliamentary Pub of the Year Awards. The Awards, run by the Campaign for Real Ale, are designed to showcase and celebrate our fantastic local pubs. Each MP across the country is able to nominate one pub from their constituency. There are no specific criteria for entry. Nus wants to hear about your favourite pub, whether it’s the best for food, has a great beer garden or is family friendly, every pub is eligible. Wealden is home to so many fantastic local pubs that it’s impossible to choose just one outstanding pub, and that’s why I’m asking for help from Wealden residents. Click to nominate your favourite Wealden pub. Nominations close on Friday 31st August, with the winning pub to be nominated by Nus in September. Best be quick, or another dozen of them will have closed before the deadline. Perhaps Nus would be better employed looking at how government cuts have seriously depleted local councils’ ability to maintain healthy, functioning communities.